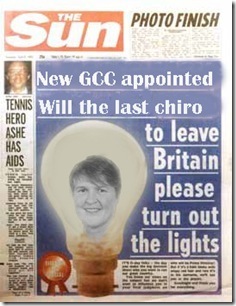 “I have also spoken to a representative of the General Chiropractic Council and asked him what the difference is. The answer? There really isn’t one. They call things different names (e.g. in chiropractic, you get "lesions" in areas/joints, osteopaths don’t call them lesions); some are more click-happy than others – but that is within each profession as well as between both. In fact, the only actual difference I can find is that in general, if you go to an osteopath you will pay for a half-hour treatment, and you will be treated for about that long; whereas with a chiropractor, you may be charged £40 for a 5minute crick-crack, if that’s all that the chiropractor thinks is needed”. We have osteopaths, acupuncturists, a physiotherapist and massage therapist working in my practice. I have more in common with the Osteopath than I have with many chiropractors. I teach exercise classes, I do treadmill biomechanical analysis, we prescribe orthotics. So clients have a number of services they can have. Usually they will have the Osteopath and Acupuncture when they are acute, as they improve they will have some deep tissue massage. When they are pain free they start on their exercise classes and I start providing chiropractic care. Correcting Subluxation, I believe thats what chiropractors do and is uniques to them. The profession has to decide how it wants to move forward. Treaters of Musculoskeletal pain syndromes, or maintaining spinal joint function. We have to improve at working with others and perhaps what we do has become the orthodox approach to spinal joint function rather than complementary or alternative. Paul talks about the Spanish college and their education, I have to ask where are these chiropractors now. Where are those chiropractors who want to preserve the future of traditional chiropractic. I look at the time I spend on this blog my partner says I am mad because traditional chiropractors dont seem to care. The UK chiropractors have kept their heads down, what have the international chiropractic community said about the situation in the UK? Nothing in April the WFC will endorse prescribing and that will be the beginning of the end, because traditional chiropractors were to busy correcting subluxations to say or do anything. this is something that is very close to my heart because I was raised thinking that only chiropractors thought of getting better in terms of enabling the body to heal itself. I soon realised this was far from true and that the chiropractic profession often does not live upto its own philosophical premise (how many chiropractors do you know who properly evaluate diet and psychological factors? )-unless of course we go to the notion that “all subluxations are spinal”? Their similar origins do ofcourse not preclude their ability to evolve different tool bags, and yes there are academic variants and technical variants, but if we are going to talk “spreading chiropractic philosophy as their own” …. I feel like I better stop Paulm123 right there; It is “their own” as much as it is “ours”. And maybe this is the whole point? We are all sick and tired of ego’s opinions and story-telling that maybe the time is right to fuse the two professions based on its common ground? In fact, whilst we’re at it: Physios are in on the act because they are starting to understand what looking at balance and symmetry is all about, thankfully their academic background is still a few steps back from ours so we should be safe for a little while longer, but ooops! I just remembered that chiropractors are down-grading theirs…. shan’t be long then? Ultimately the point is that I believe different tool bags can be good for different complaints. Treating every complaint as if you have the perfect tool bag for it is idiotic (unless you master all possible tools) and unless we define systems to identify what toolbag is right for what presentation we will not get to the bottom of this. Claiming that one tool bag is better than the other is like saying chocolate ice-cream is better than pistacchio; symptomatic of a systematic lack of awareness of the existence and raison d’etre of others. Creating a new profession which allows access to and for osteopaths, chiropractors, even physios (no disrespect) and increases standards on scientific grounds at every opportunity… such an exercise is not just obvious to me, it is the logical reunion after 120 years of split efforts… it should feedback to the members of that profession what toolbag is best for the presenting patient offering opportunity to learn those tools or refer out to those who have and master those tools. Such a profession, I would vote for whole-heartedly, because such a profession would finally drag its face out of its own backside and see what it is all about: the patient & results. Nothing else. Sorry for going on a bit, but I thought it was a point worth-while making. Here is a link to a GP and osteopath adjusting somebodies neck. I bet Blue wode cannot beleive a GP is using such a dangerous technique, doesn’t he know he could kill somebody with !!!!!!! unfortunately in the uk very little bar the GCC is intent in destroying the profession the GOC is intent in promoting their profession. indeed in many european countries including ireland (the uk’s nearest english speaking country) oestopaths are spreading chiropractic philosophy as their own.